The Fallout series has been going strong for a long time now, and many players regard the original games of the 90’s as genuine classics. And things got even better when Maryland-based company Bethesda took over the franchise, releasing the superb Fallout 3 in 2008, and later the widely-acclaimed Fallout 4 in 2015. These two were superb games set in a post-apocalyptic United States, featuring a ton of interesting quests to complete, enemies to vanquish and plenty of interesting characters to engage with in the devastated cities of Washington DC (Fallout 3) and Boston (Fallout 4). However, Bethesda has been willing to try new things with the franchise, and in 2015 gave us the good mobile game Fallout Shelter. It also shocked many people in mid-2018 when it announced Fallout 76. Was this a sequel to Fallout 4, its 2015 post-apocalyptic game? And if that was the case then why not call this new game Fallout 5? Fallout 76’s announcement left more questions than answers in gamers’ minds, and after the game’s beta in November last year and its release later on, it’s clear this is not a successor to the superb Fallout 4. For starters, there are no non-player characters (NPCs) here except for robots, plus Fallout 76’s biggest feature is that it’s an online multiplayer game. 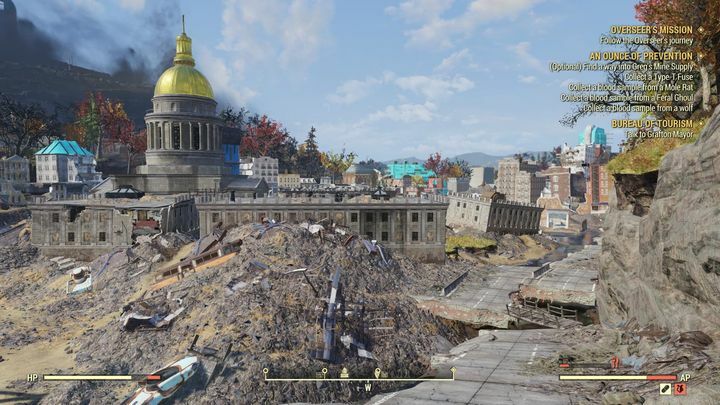 So you’ll share the game’s West Virginia setting (which is many times larger than earlier Fallout settings like Boston and Washington DC) with other players. Before you step into West Virginia (which is part of the greater Appalachia region) you become acquainted with Vault 76. This is a nuclear bunker where you and other survivors took shelter before the bombs fell, and where Bethesda takes the opportunity to deliver some hints and tips before your journey through Fallout 76’s Appalachia begins. You’ll also get to pick up the Pip-Boy, the wrist-mounted computer which has become a staple of Bethesda’s Fallout games. 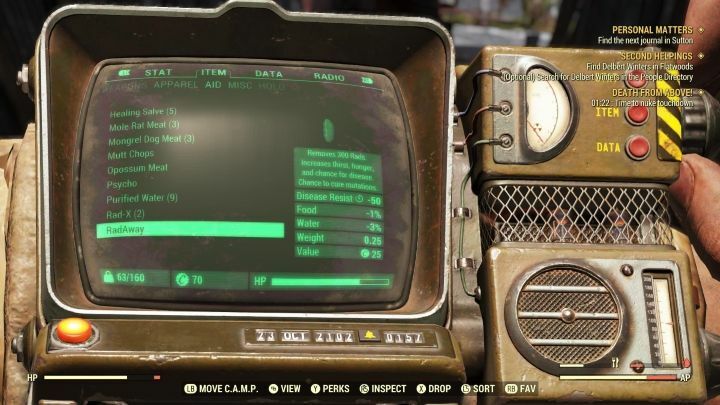 Using the Pip-Boy, you can access a wealth of in-game information, including active quests, inventory, your character’s stats and other stuff, including hunger and thirst levels (more on this later). Once you exit the Vault, you get to step into Appalachia proper, and once you begin exploring it doesn’t take long to realize that the world has seen better days. This is because West Virginia has turned into a desolate wasteland two decades after the bombs fell, with ruined buildings and billboards, broken electricity posts and even crashed planes dotting the landscape. Elsewhere in West Virginia, nature has taken over, and you can walk through colourful forests as you explore Fallout 76’s setting. Like in the earlier Fallout games, you can access all important game information from your Pip-Boy. And truth be told this is a great post-apocalyptic setting, and a more colourful one than that of Fallout 3. Also, Fallout 76 can look great at times. The ruins of the West Virginia capitol building are an impressive sight for instance, and seeing sunlight shining through tree leaves while in the middle of one of Appalachia’s forests creates a suitably eerie mood. 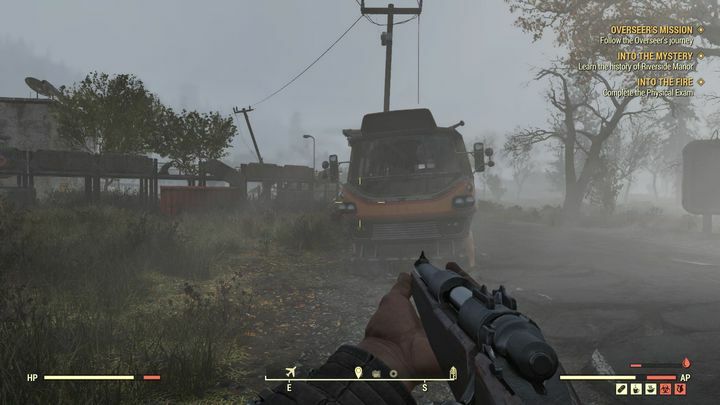 There are also an impressive variety of weather conditions here: foggy, rainy and sunny weather features in the game’s world, plus every now and then a radiation storm will make you seek cover inside one of Fallout 76’s decrepit buildings. Nonetheless, the truth is that Bethesda’s engine can look dated at times too, with the game not looking as good at points. Sometimes I get the feeling this engine is creaking at the seams, and will need an overhaul for the company’s next major game (likely the eagerly anticipated Elder Scrolls sequel fans have been waiting for). It is likely, though, that you won’t have so much time to enjoy Fallout 76’s post-nuclear landscapes and other decrepit locations though. This is because the game’s West Virginia is teeming with enemies and hostile creatures including the tortoise-like mirelurks, radroaches, the zombie-like ghouls, former humans turned into monstrosities known as the Scorched, as well as the classic super mutant enemies seen in earlier Fallout games. Enemies do put up a fight here, which is nice. There’s a weird delay before enemies drop dead (which may have to do with the fact this is running in an online environment), meaning the combat doesn’t quite feel right here even though I found it to be mostly fun thorough. And given that enemies are no pushovers, it’s also a good thing that if you die during the course of a fight, you can always retrieve your dropped loot. Other players can pick it up if you don’t, though. 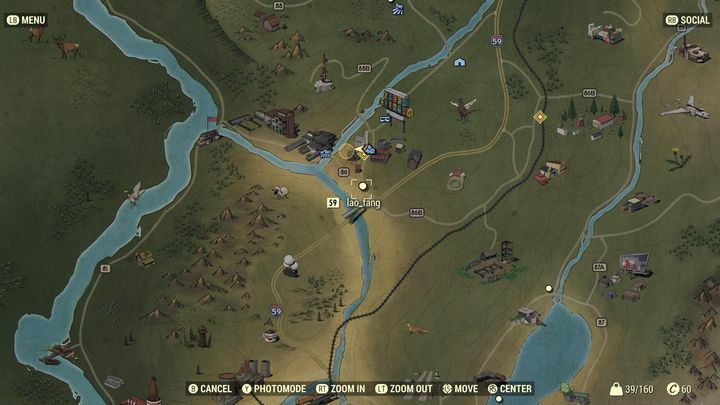 However, this is a not a common occurrence (it only happened to me once during my time with Fallout 76) because the game’s Appalachia map is about four times larger than earlier Fallout maps, meaning you won’t be running into other players most of the time. Actually, my encounters with other players in Fallout 76’s West Virginia were few and far between, making me think at times that all the extra real state was just a waste of space, despite featuring quite a few interesting places to visit such as a water park, medical facility, an airport and West Virginia capitol building amongst others. The remains of the day… The world lies in ruins after the bombs fell. Also, you can locate other players by bringing up the map at any time. They appear as white dots on the map, and the player’s name in Fallout 76 and level appears if you hover the pointer over a dot representing a player. One thing that immediately drew my attention is how players of wildly different levels share the same map (which can accommodate about two dozen players at once), something that doesn’t feel quite right. Maybe it’s the fact that Fallout 76 doesn’t have as many players as a game like Fortnite, but it still feels odd to share the map with players of level 50 and up when I was only at level 13 for instance. This also brings up the matter that you’re unlikely to find interaction with other players very satisfying here. For instance, while you can trade items with other players, I could not find anyone willing to do this during my time with the game. Plus, it makes sense that higher level players won’t be interested in trading with lower level ones – I also lost interest in exchanging items with newcomers when I climbed levels and became a higher-level player. There’s also the matter of PvP (player vs player) encounters which you can engage in when you hit level 5 in the game. At some point during my playthrough I was attacked by another player, who took caps (Fallout 76’s currency) from me. And admittedly having to take part in a PvP encounter was a moment of excitement amid the dullness that playing Fallout 76 generally represents. Sadly, this particular guy kept following me throughout the wasteland, killing my character and stealing my caps… Thankfully, Bethesda has given players the means to block those who chose to behave like boors in the game, and you can block any players from your game session if you wish. There are also “Events” you can take part in every now and then, which appear highlighted on the map. These are clearly designed so that players band together to take them on, but like every other multiplayer aspect of Fallout 76, this falls flat too. I was only able to participate in two events with other players, and truth be told this wasn’t a memorable experience. These quests are very simplistic, and for instance one just involved putting items inside a machine in a food processing plant while fending off enemy attackers. Another event I took part on my own had a similar theme and involved defending several points from attack for a set period of time in what looked like an industrial complex. Fallout 76’s setting of Appalachia sure is huge. Big enough for you to not run into any other players during your playthrough though. Doing things on your own and everyone just going about their business is the rule here despite this being billed as a multiplayer game, and given that the multiplayer aspects of Fallout 76 are so disappointing, I at times wondered what’s the point of this being multiplayer? At least playing music on the radio (which like in earlier Fallout games you can access from the Pip-Boy) serves to mitigate the feeling of loneliness, and there’s a good selection of 50’s-era tunes to enjoy while you’re trekking through the West Virginia wasteland. Also, as I pointed out earlier, you can pick up radio transmissions through your journey in Appalachia which lead you to quests throughout the world. Sadly, though, most quests in Fallout 76 are not so exciting. The main quest involves the Overseer, the leader of Vault 76 who left the Vault earlier than anyone else after the bombs fell. You get to follow her journey through Appalachia, listening to holotapes (you can play this on your Pip-Boy) which shed light on the events that transpired in West Virginia after the nuclear catastrophe. There’s also a do-gooder group known as the Responders involved in Fallout 76’s story and you get to learn more about them by reading texts on the computer terminals scattered throughout the game world. Aside from the holotapes, these retro-looking terminals are another way in which Bethesda has delivered the story in the absence of NPCs here. Aside from the main quest (which isn’t particularly interesting) there are a few engaging quests here, such as discovering a kid’s fate looking for clues and listening to holotapes at several locations in Appalachia. 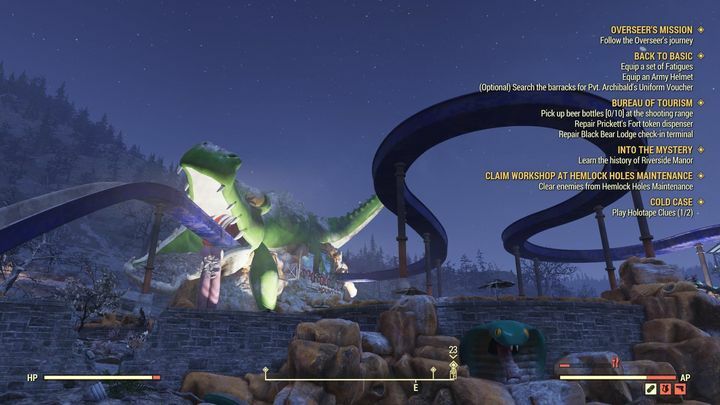 This also takes place in one of the most imaginative locations in the game, a water park in the northern part of Fallout 76’s West Virginia map. Another involves exploring a manor infested with the game’s Scorched enemies in order to discover its mysteries, another fun quest. Fallout 76 features some interesting locations such as a water park. Pity the gameplay isn’t up to scratch though. However, despite having some good quests, the abundance of menial quests objectives here is a let down. At times I had to perform tasks like equipping an item of clothing, searching for a voucher inside a military barracks, picking up a set number of objects, repairing stuff… The list goes on. These objectives felt like chores, and would end up becoming boring after a while. Also, the right hand side of the screen can become cluttered with quest objectives, although thankfully individual quests can be toggled on or off using the Pip-Boy, letting you focus on only one or a few quests if you wish. If you get tired of Fallout 76’s quests, an optional activity in the game which you might enjoy is setting up your CAMP. This is a settlement you can build at certain locations on the map (not too close to named locations or landmarks though) and can be as elaborate as you want: you can build floors, walls, stairs and put up defences to settle your little corner of Appalachia. Adding a cooking station will let you cook food and prepare drinks, which will do a better job at sating your hunger and thirst better than the raw meat you get from creatures you defeat in combat and the dirty or toxic water found in Fallout 76’s streams and lakes. You can also take your CAMP with you to another location, something which will cost you caps. I did not find building a settlement very interesting though, while the potential reward of raiding other players’ is diminished by the fact that player CAMPS can be moved to other locations at the touch of a button. Being able to fast-travel to the CAMP is handy though, and costs no caps. As stated earlier, there are survival elements in Fallout 76. Actually, every now and then your character in Fallout 76 will go hungry or thirsty, meaning you’ll need to eat or drink something when your food or water bars are in the red. If you don’t, your maximum number of action points (which determine for how long you can sprint for instance) will be reduced, plus you’ll even start taking damage and begin losing hit points when you reach a point where you begin dehydrating or starving. The water bar (bottom right corner) is in the red, meaning it’s time to drink… Otherwise you won’t be able to sprint like a chicken in Appalachia. I did not find taking care of these needs boring in the game though, due to the variety of raw foodstuffs you can pick up an eat, and also the variety of cooked food and drinks which can be prepared at cooking stations, making this aspect of the game quite fun. Also, you can find out in the Pip-Boy how much HP you’ll recover by consuming an item of food, as well as how many rads you’ll gain by eating it. As in earlier Fallout games, you’ll have to worry about radiation here, which reduces your maximum number of hit points, but can be dealt with using special restorative items known as “RadAway” as in the earlier games. Other aspects of the game leave quite a bit to be desired though. Aside from the fact that the multiplayer elements are poor, the VATS system is pretty much worthless here. VATS (Vault Assisted Targeting System) was a highlight in the earlier Fallout games, mainly due to the fact that time would slow down, allowing you to target body parts individually. Fallout 76 being an online game though, this all happens in real-time meaning there’s much less time to think which parts to target, and this reduces the tactical value of using VATS in the game. Actually, I hardly used it throughout my playthrough. And as I pointed out earlier in this review, Fallout 76’s real-time shooting is less than perfect. However, the fact that guns and other weapons break down during combat is realistic and adds to the feeling of immersion, even if sometimes searching for a serviceable weapon in the inventory can be a pain. There are many weapon and ammo types to consider, although thankfully you can sell extra weapons (and excess junk) at vendors located in train stations throughout the world. There’s also Fallout’s SPECIAL system, which allows you to boost your character’s attributes in the game (Strength, Endurance, Charisma and so on) by spending a skill point every time you level up. What’s new here are the “perk cards”, which you can equip to gain advantages in the game, even if some of these (such as one which gives you buffs when you’re adventuring with a group of other players) seem like a waste, given everyone is just going about their own business in the game’s world. 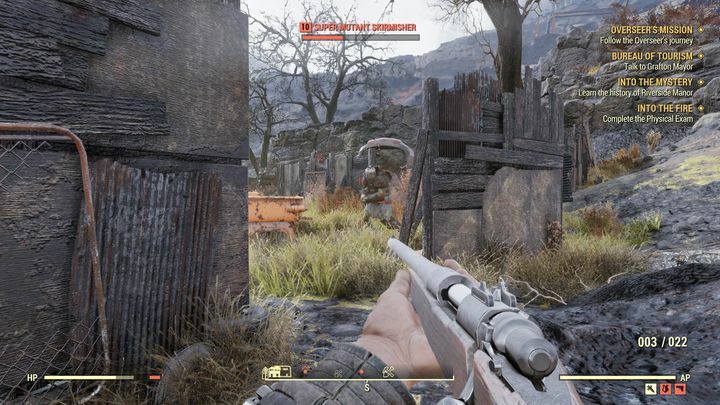 And as is usually the case with Bethesda’s games, there are a few funny glitches here (like enemies floating over terrain), while Fallout 76 does suffer from poor performance, with the game slowing down at times. So, what to make of this latest Fallout game? Fallout 76 is an online multiplayer game that’s best played solo, and that in itself is a pretty damning statement. True, other Fallout games have made slipups in the past – Fallout 3 had that much-hated hard ending, for instance. But this is the first Fallout game by Bethesda I simply cannot recommend, and trekking through the game’s huge Appalachia map I can only help but wonder how good this could have been, had Bethesda decide to make a proper sequel to Fallout 4 instead of the failed multiplayer experiment Fallout 76 sadly is.